What's it like to take a ballet class when you're blind? The Royal Opera House's weekly class for blind and partially sighted people debunks the myth that ballet is a solely visual art form. Participants of Monday Moves, ballet classes for blind and visually impaired people © 2016 ROH. Photo by Brian Slater. For most, ballet is a visual art form. The corps de ballet move together as if they are one body, reacting to each other to synchronize their movements and complement their positions on stage. So how can such an art form be accessible to blind and partially sighted people? For over 25 years, the Royal Opera House's Monday Moves project has been challenging that very presumption of the art form's visual nature, with weekly ballet classes specifically for adults with sight impairment. ‘It was an experiment to see if visually impaired people could do ballet,’ explains Maggie, one of the founding members of Monday Moves. Many of the participants had tried other dance classes in the past, but found them difficult to follow as they couldn't see what the teacher was doing. 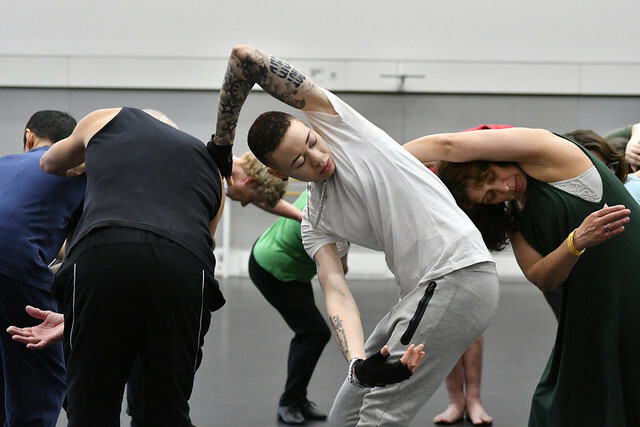 At Monday Moves participants have a shared movement language in the form of ballet's French terminology, enabling faster and more accurate responses to vocal instruction. Listen to the full audio feature produced by RNIB Connect Radio, Europe's first radio station for blind and partially-sighted listeners. Monday Moves is generously supported by the Lord Leonard and Lady Estelle Wolfson Charitable Foundation. Thought this is great but need dance classes in the day time as i am visually impaired and have night blindness.i enjoyed ballet for years but would like to dance more contempary as a mature student. This is amazing. Can you please upload to the youtube channel? Such an amazing intiative. As a partially sighted person, I don't think I would have been able to do all the things I do now, had my parents not packed me off to ballet class aged 4! The strictly symetrical training helped me to improve my sense of my balance, it increased my awareness of space and the blind spots, it added to my social independence. Because dance taught me to turn and jump, I was determined to crack the lack-of-perspective problem, car-driving nut. It took a while, but some 2 million miles later across several continents, I can say that dance, and in particular dance with other people, made all of this possible. And at 70, I am still dancing! Go for it! Thank you to the RB for taking this initiative. Please keep it going.